FTA Ama Dablam 2010 – Summits! Fabrizio called in from C2 to let us know that he and the team had just returned from a successful summit bid! Summiters included Roger, Ruud, Michael, Siddhi and Fabrizio and they topped out on a clear day at noon and returned to C2 at 6:45pm. Fabrizio said they had fantastic views of all the peaks from Everest to Cholatse and that they made the top despite strong winds. Special thanks goes to our sherpa guide "super" Siddhi who has worked tirelessly all expedition to ensure a safe and successful summit for the members. Between Siddhi and Fabrizio there have been a lot of extra loads, runs, carries and work that goes into guiding an expedition. Well done lads! It sounds like Erika and Jack were not feeling strong on the way to C2 the previous day and decided to not join the push and left the hill for another day. With experience on Everest for Jack and the Polish Glacier on Aconcagua for Erika, they certainly have a good background for making wise choices and we applaud their decision! We'll look forward to more reports and images in the days and weeks ahead! Here is Fabrizio's dispatch from c2 - enjoy! 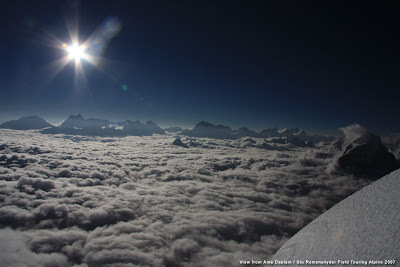 View from the dablam on the descent with the world below! 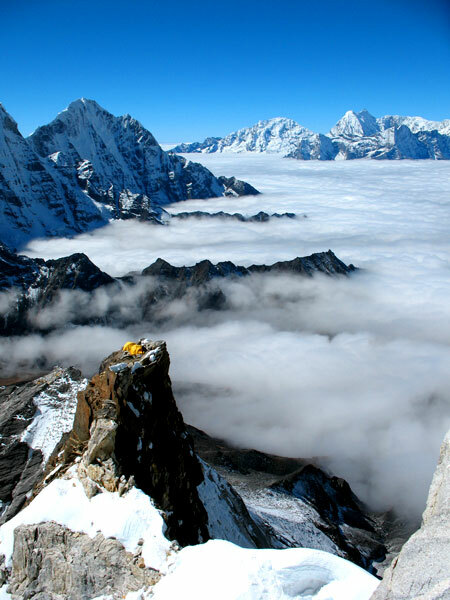 FTA Ama Dablam - Summit bid tomorrow! Fabrizio has left an audio dispatch from C1 with the latest on the team's efforts on Ama Dablam and the news is excellent! Fabrizio and Siddhi are in C1 with half the team and the other half is resting in C2. Tomorrow morning at 1am the group in C1 will leave, join the group in C2 and push for the summit! We should have news from the top or from when they are back in camp. Stay tuned for more! Listen to the dispatch below! View from C1 on a beautiful afternoon! The awesome traverse just below the Mushroom Ridge! 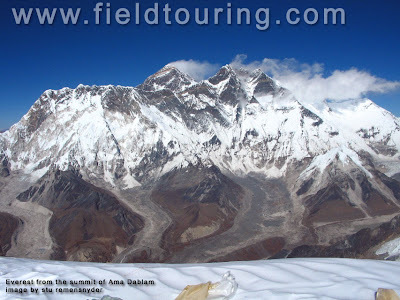 View from the top to Everest on a clear day in 2005! When they get back to BC they will hopefully have a great treat in store! 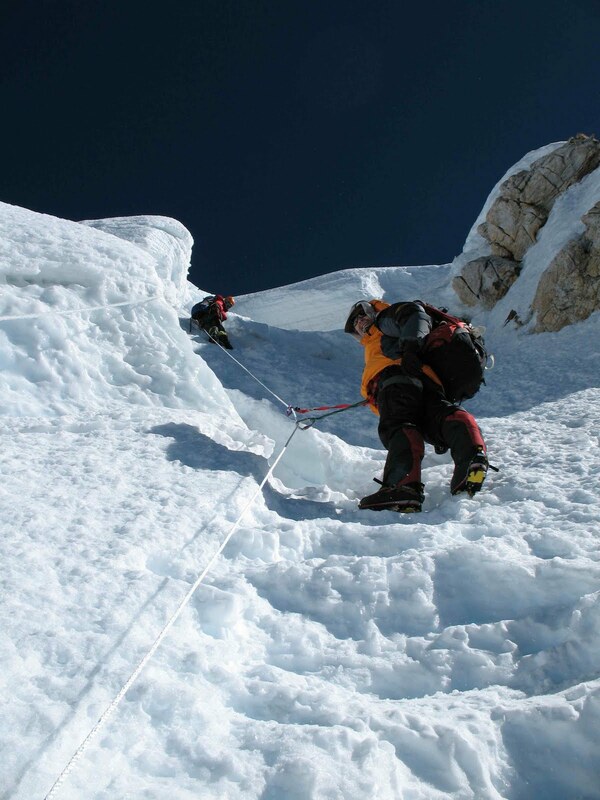 FTA Ama Dablam - C2 established and summit bid ahead! 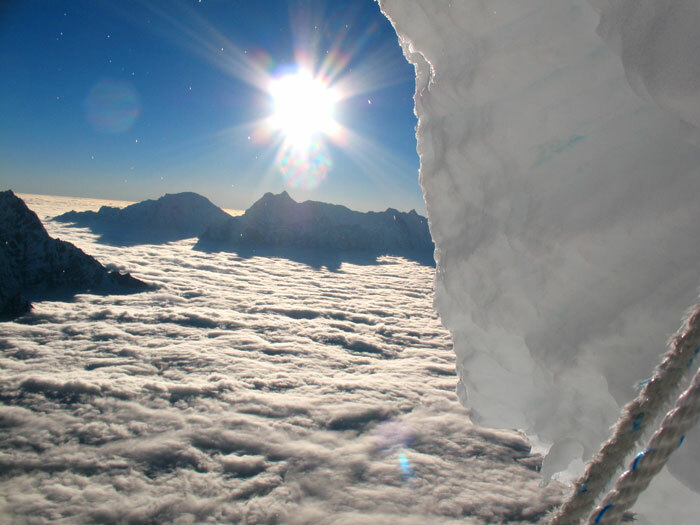 Our team has established a high camp and we expect news of summit bids in the next few days! The weather has been clear but windy and looks to remain so through the 27th. Winds in the 40-50km/hr level are expected at the 7000m level so they will have high winds for sure on the summit. The climb is often in the lee of the wind and on 2 of the 3 times i have been to the top we had little or now winds on the slopes from C3 to the summit but were buffeted by very strong winds on the top itself. The last 100 meters can be simply a fight to get the top when minutes before all was calm. Fabrizio checks in from C1 to lets us know that the team is well positioned for a summit bid and they hope to move to C2 tomorrow and summit on the 26th! As soon as we have any word on the summit attempts we'll post them here! Ecuador/Cotopaxi Prep - Alpine Training with Matt Schonwald! FTA guide Matt Schonwald put together a great 2-day intensive prep course for one of our Ecuador Volcanoes Jan 5, 2011 members Sarah Hunter and his report on their snowy odyssey is below. Matt offers single or multi-day intensive alpine training trips (in the Pacific Northwest) custom built for individuals or groups for any objective from Mont Blanc to 8000m peaks. 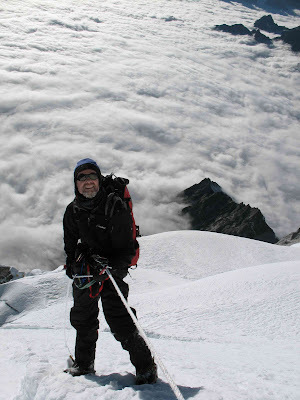 With his background climbing and guiding the very coldest off peaks (Vinson, Denali and more) Matt is a perfect teacher for anyone interested in beefing up their skills and confidence before a big trip. We offer similar prep trips on the east coast as well with so let us know how we can help you get ready for your next big adventure! There are spaces still available for the Jan 5 Ecuador trip led by Brad Boehringer so let us know if you want to tromp up 4-5 volcanoes, east great food and practice your Spanish! Hitting the 3rd week of November and my 'stache is taking on it's own personality, My competitive nature shines through as if I am actually training to win the best mo' in December when my friends get together check out each others 'stache. A few days ago, I had the pleasure to spend a few days on Mt Baker, aka Kulshan in November with Sara Hunter prepping for a climb on Cotopaxi in January. Our timing coordinated nicely with 3 feet of new snow that added 2 miles to the approach and some extra caloric boost to our hike in. After breaking trail for 4 1/2 hours, we camped at the historic Kulshan cabin site where Fred Beckey started his first ascent of the North Ridge many years ago. We hunkered down to a long, cold night with a quick skills session followed by Indian food and chocolate to put us to bed with full stomachs. At sunrise, we enjoyed eggs, sausage and hash browns with fresh brewed coffee to warm ourselves up for the hike to the Coleman Glacier through thigh deep snow. 2 hours later we made it to Survey Rock and headed down to the ice to get our crampons dirty and hit something solid with our axes. This was harder then it sounds as 3+ feet of snow separated us from the glacier and all the visible blue was overhung ice. Two hours later, we stomped some ice into enough cubes for a few cocktails and made good progress for Cotopaxi with Field Touring Alpine's Ecuador January trip. Sara revealed to me her hometown is in Maine and she loves cyclocross which made this overnight winter experience seem tropical in face of 5" of new snow overnight with temps in the teens. After breaking trail for a total 6 hours in 2 days, we roped up, self arrested and climbed enough ice to strike fear into Cotopaxi, good luck in January Sara! 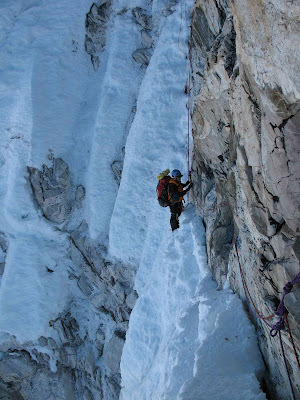 All is well at Ama Dablam and a summit bid is brewing! On the 18th the entire team took a run to C1 and spent the night. On the 19th Siddhi and Michael went on to C2 to set up tents and then joined the rest of the team in descending to base camp. The plan for the teamis to eat, sleep and rest a few days and then make a summit bid! Stay tuned for more new of a summit push! Fabrizio checks in to let us know that the team is headed to C1 after three days of rest from summiting Island Peak and that everyone is feeling well. They have been enjoying lounging in BC (enjoying the warmth of the new BC heater system! ), taking trips to the monastery in Pangboche, and eating more meat than "we could fathom that an expedition could have"! The team is loading up and readying for a slow walk to C1 today. The plan is spend the night in C1 and tomorrow establish C2 and potentially stay in C2. Most likely they will set up the tents in C2 and return to BC to prepare for a summit push. Fabrizio notes that they are one of just 2 teams now in BC and it is as stroke of fortune to have Ama Dablam nearly to themselves! Just 2 weeks ago there were more than 100 climbers and now just the Fta team and one other small group. Yet another reason our Nov trips have been so great the last 3 years! We are already accepting applications for 2011 so let us know if you need a great trip to Ama Dablam with a highly experienced team! pic: C2 from the Gray Tower in 2007 - quite a spot for a night! FTA Ama Dablam 2010 Autumn - Island Peak Summits! Our team has already topped out on Island Peak and is back safely at Ama Dablam BC! We are waiting on all the details and hope to have them shortly! Our group arrived back in Ama Dablam BC yesterday and tomorrow plan to head up to C1. After a night in C1 they will either return to rest in BC a few days or make a move to C2 if everyone is feeling well. Fabrizio calls in from high camp at 2:15am to let us know the team is about to set off for the summit! He reports that the weather is perfect - pretty warm and clear skies above. Fabrizio adds that this is what he loves about night climbing...to see "headlamps dotted along the slope and lots of stars dance"! Audio Dispatches #2 from BC after the summit! Fabrizio checks back in from BC at 12:30pm on 14th to let us know the entire team had a successful summit day on Island Peak! The team arrived at the top around 8am in peefect conditions and enjoyed views of the north face of Ama Dablam and the south face of Lhotse! They will head back to Ama Dablam tomorrow for a few well deserved rest days! 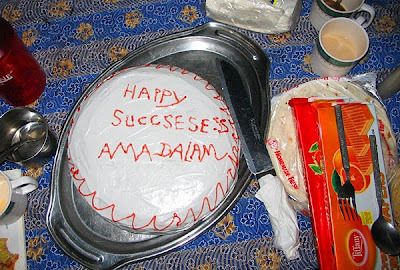 FTA Ama Dabalam Update - En route to Island Peak! Hello from Ama Dablam! Well actually Pangboche - I ran down to town as there is fast internet in a lodge there. We made it to base camp in great condition, everyone is feeling fit in the group. Today was a much deserved rest day, and a bit of packing, as tomorrow we head off to Island peak for a few days to acclimatize before climbing Ama Dablam. Many teams have been topping out the past few days and base camp is clearing out nicely, when we return from Island Peak there should only be a couple of teams remaining. There is talk of a bit of bad weather coming in but it should not derail any of our plans. Team is now in Dinboche and everyone feeling great. They have had great views of Ama Dablam and are excited about heading to Island Peak! Our expedition to Ama Dablam under the leadership of Fabrizio Zangrilli is under way and the team is now in Namche enjoying a good time acclimatizing. We'll begin to have updates every 3-4 days over the course of the expedition here at our blogspot and also will update on twitter at www.twitter.com/fieldtouring. "Hello from Namche Bazaar. All of the group are doing great, in fact they are some of the fastest members I have ever had. We have been sitting around at the bakery eating yummy baked delights when we hear that a helicopter crashed at Ama Dablam. I know no details at this point, but we are all fine. I know many people who are at base camp right now, I hope that they are all ok. The latest news is the helicopter crashed on the north side of the mountain on the 6th while attempting to rescue climbers on that side of the mountain. News is still sketchy, and very much third hand, but wanted to put people at ease who new people on the Normal (SW Ridge) route." Updates are now on the web and it looks as though the pilot who was flying the rescue was the pilot responsible for the highest rescue ever performed and he was on an attempted rescue on the north side of Ama Dablam. Sabin Basnyat and an engineer were attempting to rescue two climbers from Mount Amadablam, a 6812-metre peak near Everest, when their helicopter crashed. Witnesses reported seeing it burst into flames before smashing into the mountainside. "We can confirm that one of our rescue helicopters has crashed in the Everest region. We have sent a helicopter to the scene," Fishtail Air executive Manoj Gurung said. Earlier this year, Basnyat made history when he piloted the world's highest ever rescue mission, airlifting three sick Spanish climbers from Mount Annapurna. Our thoughts are with the families of Captain Sabin Basnet and Engineer Purna Awale who lost their lives in the crash. 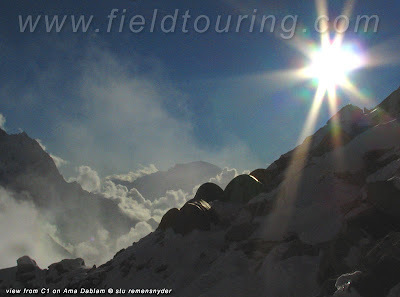 We have upcoming expeditions to Aconcagua and Ecuador during December, January and February and are already booking trips for Broad Peak, K2 and Nanga Parbat for summer 2011 as well as for Spantik, Satopanth and Ama Dablam for next autumn. We have loads of trips for every level climber and trekker and hope you'll join us for a trip in 2011! Check out our full line-up at the main site "www.fieldtouring.com"